This tutorial requires a custom menu controller file to be imported into our project for the paper app like menu. This class file is made freely available to us by soyzamudio on Github. You can download the class file from here. (Download Link). All credits go to soyzamudio for this conversion of GTAppMenuController class files to Swift. The download link mentioned above provides you with necessary Class file which we will use into our project in future. Also download 2 images which we will be using in this tutorial for better visuals. (Download Link). 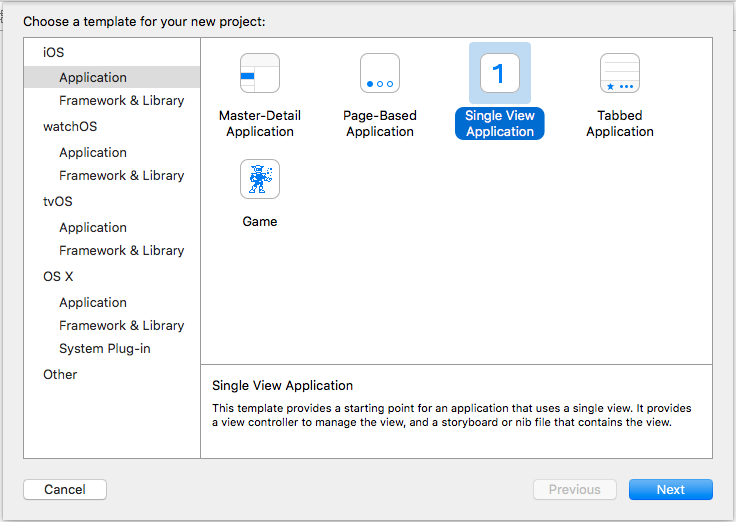 Extract the images and drag all the files into our Xcode project. Now we’ll set up the storyboard. In this app we will only focus on a home screen & menu screen transition. 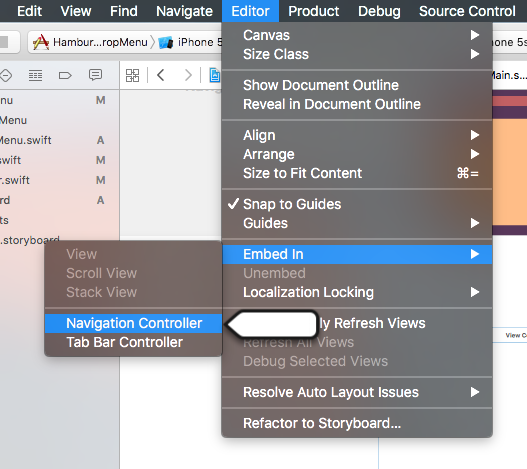 Open Main.storyboard and you will see a single ViewController. Add a new Cocoa Touch Class file by pressing cmd + n and name it MainMenuViewController. Remove the entry point (an arrow pointing to the navigation view controller). Select the newly dragged viewController and go to the attributes inspector. Tick the is Initial View Controller option which will make this view as the starting point. We will then set the class of the view controllers from the identity inspector on the right. View Controller has default class set and hence we won’t be changing it. Select the navigation controller and set it’s class to SwiftAppMenuController (the file which we recently downloaded from dropbox). Also change it’s Storyboard ID to ” home ” which we will be using in future. Now select the other ViewController that we dragged earlier and set it’s class to MainMenuViewController. Also change it’s Storyboard ID to ” menu ” which we will be using in future. We will add UIImage View from the object library to both the ViewControllers, it will show an image that presents the UI of any regular application. Set the UIImageView of home view to home.png file and UIImageView of menuView to menu.jpeg. This fast way was chosen to showcase some good UI just to let you know how it will look on a well developed application. Let’s understand the code written above. First we create an instance of the UIStoryboard with name Main (which is our storyboard in the project). We then create an instance of MainMenuViewController and SwiftAppMenuController using instantiateViewControllerWithIdentifier method. These controllers are set to the backWindow and window’s rootViewController. Window is the main screen our app will present and when app finishes it’s launching the SwiftAppMenu controller will be loaded in front with the MainMenu view at the back of the main window. In the above lines we create an instance of SwiftAppMenuController as navController. We then apply some fancy stuff to the navigation bar with title and translucent properties. The next lines add a right bar button item to the navbar which will activate the menu using the rightBarButtonItem method. This was implemented for those who want a navbar button menu activation. But in this tutorial we will hide the navbar and initiate the menu by swiping down the home screen. This will be achieved detecting a swipeDown & swipeUp gesture using UISwipeGestureRecognizer. First we create an instance of UISwipeGestureRecognizer and then detect it’s direction. When a particular direction is detected the action calls a function “respondToSwipeGesture:” which we have specified while creating the instance. The code above gets the UIGestureRecognizer passed from the viewDidLoad and the switch statement accordingly runs the up or down directed gesture. Now what is this menuPressed() function, we also saw the same in the viewDidLoad func in the rightBarButtonItem. Well this function calls openAndCloseMenu method from the SwiftAppMenuController class. It calls the menu by pushing the current view down. If the menu is present it will push the homeView to front and hide the menu. So basically it acts as a toggle for the menu. This is it! 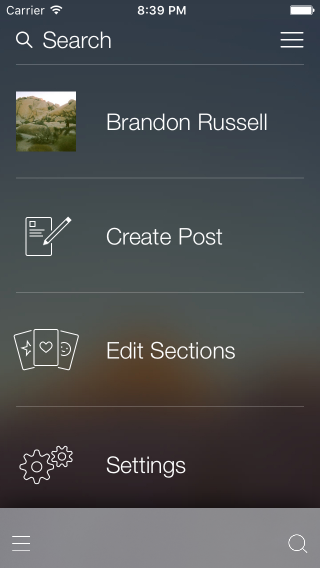 We have just mastered creating a Facebook’s Paper app like menu. Then wait a bit while the simulator loads. Mine took about 20-25 seconds to load. Then click on a menu button and watch the magical menu dropdown occur!